A stunning 9ct white gold ring boasting gently twisting shoulders set with diamonds and a sparkling halo cluster totalling 3/4ct. Perfect for an engagement, make sure your magical moment is as special as it can be with this beautiful ring. 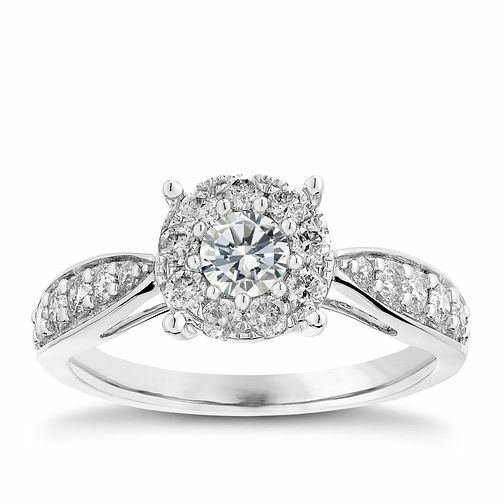 9ct white gold 3/4ct halo diamond ring is rated 5.0 out of 5 by 1. Rated 5 out of 5 by Anonymous from Superb I bought this ring for my now fiancee earlier this year; she was absolutely over the moon with it and is always receiving compliments about how beautiful it is. When I saw it for the first time in the flesh (actually when I collected) I was really taken back by just how perfect it was. Thrilled. What I like about it is you do get plenty of bang for your buck with this ring whilst neither being cheap nor ridiculously expensive either. Can't fault it. It's very shiny and looks great on her.